This trike-style delivery model features one front wheel and two rear wheels. 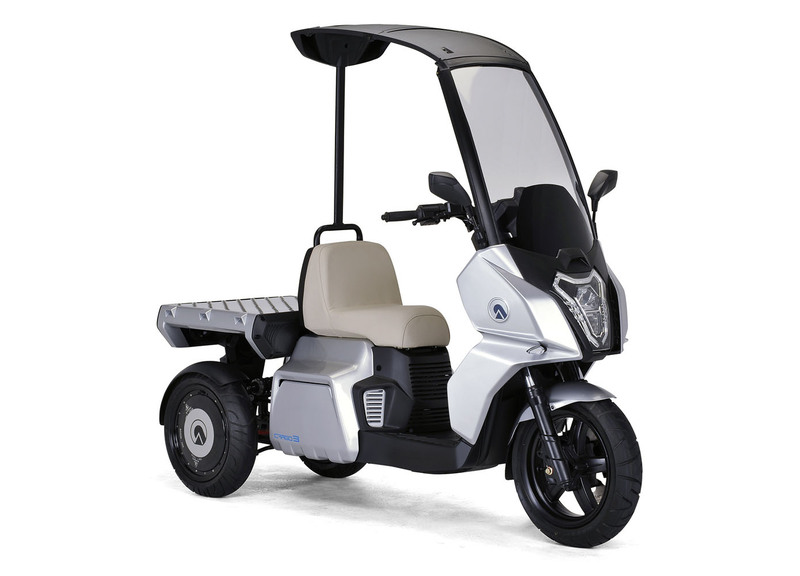 The large rear carrier (Size: 700mm x 640mm / Max Load: 100kg) offers superb carrying capacity, while the front screen and roof protect the rider from the elements, making the AD-Cargo an excellent addition to the business scene. Its stylish Italian design is another characteristic feature. The AD1-E is an electric version of the AD1 200, a roof-equipped, gasoline-powered three-wheeled scooter. With the weight savings gained by eliminating the engine (-22kg), and its silent operation, the AD1-E represents an evolution in urban commuters. In addition to offering UV protection, the front screen shelters the rider from rain and cold wind. Windshield wipers with two settings ensure great visibility, even in the rain. The roof can be easily removed and stored in the rear trunk. ADIVA obtained the global patent for this folding roof in 2004. The fun and easiness of a motorcycle. The safety and comfort of an automobile. 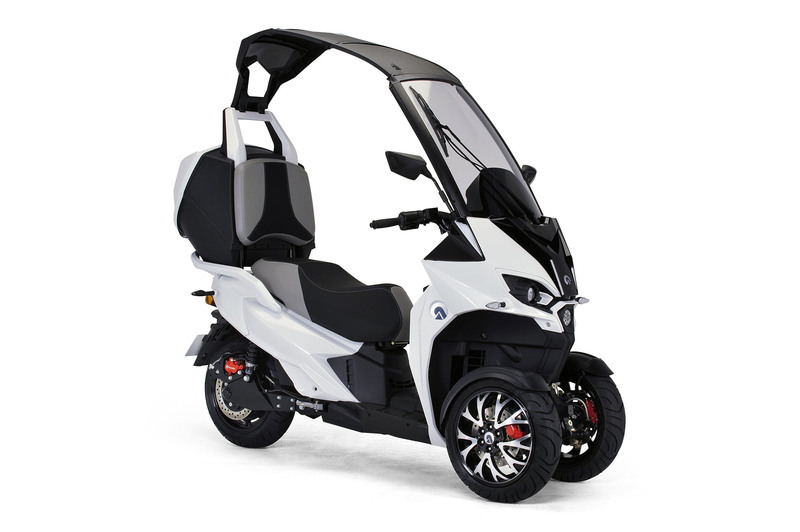 With two front wheels and one rear wheel, combining all these merits is exactly what the innovative chassis design of ADIVA’s three-wheeled scooters does. Based on automotive double-wishbone suspension, our “Independent Quattro-Wishbone Suspension” offers superb stability when cornering and braking, while contributing to excellent comfort when riding on poor road surfaces or over bumps, among its many benefits. With a riding feel distinct from motorcycles and automobiles, ADIVA offers a new experience unavailable anywhere else. Mesh-design aluminium wheels are standard equipment. Gleaming black paint with machined surfaces results in a black and silver two-tone finish. Red brake callipers visible from inside the wheels add to the sporty impression. The 40L rear trunk offers plenty of storage space for a large bag. Or it can hold a pair of helmets and rain gear. Colour-matched paint and a design that flows naturally from the bodylines are characteristic features. When considering possible power units for next-generation motorcycles, electric motors seem the most likely replacement for gasoline-powered engines. 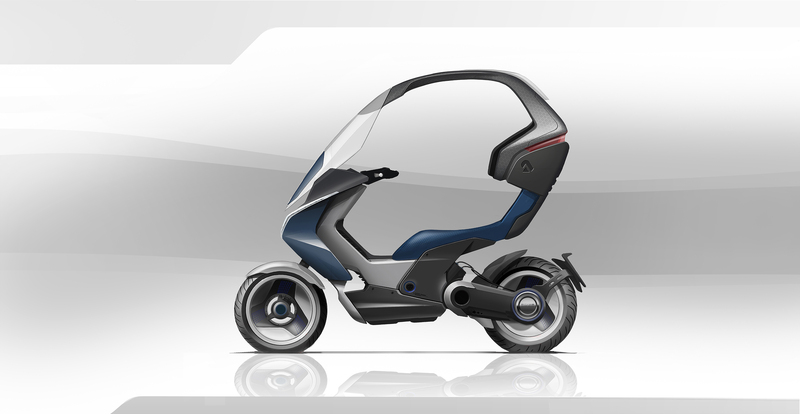 To support the diffusion and development of electric vehicles, ADIVA designed a model with the potential to become an electric motorcycle platform: the roof-equipped two-wheeled EV “Concept-E”. The wheelbase was set at 1,500mm – standard for a 250-400cc class gasoline-powered model. At this length, it would be easy to use for riders of all sizes. Befitting a lightweight chassis, the undercarriage has a simple construction. Using a “Modular Power Unit System” enables the motor and battery to be easily exchanged to suit the desired use, whether it be city riding, long touring, or sport riding. The concept is an extension of the “Modular Protection System” that helped establish the ADIVA brand and its goal to “Make Moving a Pleasure” for all riders.